Guy Ritchie (Sherlock Holmes) directs the Warner Bros. Pictures' presentation of King Arthur: Legend of the Sword, an exhilarating version of the English tale. Ritchie comes from a comedy background as a director of films and it is so evident in this medieval story of King Arthur, which arrives in theatres May 12, 2017. Co-produced and co-written by Guy Ritchie, King Arthur: Legend of the Sword is about the legendary blade that has mystical powers, seen through the eyes of an orphan boy named Arthur. It seems Arthur was born to be King, but he doesn't know it. His evil uncle Vortigem, played by English actor Jude Law (Sherlock Homes), is killing all family members in the way of him getting to the thorn of England. English actor Charlie Haunnam ("Sons of Anarchy") is Arthur Pendragon the young Englishman who was raised in a brothel as an orphaned boy until adulthood. Arthur gets wrapped up in his Uncle King Vortigem's devious search for the man who can remove the Excalibur from the stone just so he can eliminate him as a royal bloodline threat to the crown. Arthur, just out to make some money that any man who participates in trying to pull free the sword received, removes the sword and now his Uncle knows who he truly is. When Arthur is able to handle the power of the sword he can see also who he is and what happened to his parents. What transpires next is an adventure that is full of fantasy, drama and perfect comedic relief moments. Rated PG-13 King Arthur: Legend of the Sword is also co-produced by Akiva Goldsman, Joby Harold, Tory Tunnell, Steve Clark-Hall and Lionel Wigram. Co-screen writer is Joby Harold. King Arthur: Legend of the Sword also stars West African actor DJimon Hounsou (The Legend of Tarzan) as Bedivere who becomes a knight of "King Arthur'; Spanish actress Astrid Berges-Frisbey (Pirates of the Caribbean) is "The Mage" (Guinevere); Australian actor Eric Bana (Hulk, The Finest Hour) is Uther Pendragon - Arthur's father the true King; Tom Wu (Skyfall) is George a fight trainer who also becomes a knight of King Arthur's roundtable; Kamil Lemieszewski as Merlin; Annabelle Wallis as King Vortigem's Maid Maggie; Irish actor Tony Award winner Aidan Gillen ("Games of Thornes") as Bill Wilson another friend to become a knight at the roundtable; English actor Freddie Fox (Victor Frankenstein) as Rubio Arthur's childhood friend also part of the group to be knights; Craig McGinlay as Percival; Kingsley Ben-Adir as Wetstick a friend of Arthur, and Neil Maskell as Backlack. It also stars David Beckham, Millie Brady, Michael McElhatton, Mikael Persbrandt, Lorraine Bruce, Hermione Corfield, Katie McGrath, and Poppy Delevingne. "King Arthur: Legend of the Sword" is a Safehouse Pictures, Village Roadshow Pictures, Warner Bros. Pictures, Weed Road Pictures and Ritchie/Wigram Productions production. 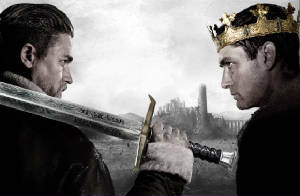 Watch the trailer or learn more about the Warner Bros. Pictures' presentation by logging onto www.KingArthurMovie.com.